Grace's Toys and Dolls, previously known as Second Childhood, has been located at the corner of US Highway 41 and 168 in Fort Branch, Indiana for over 20 years. Linda Keller, owner of Graces Toys and Dolls, started at this location selling antiques with her husband David. 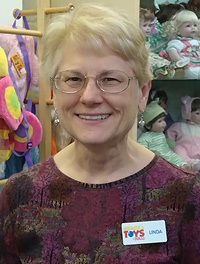 Yearly trips to Toy Fair in New York has allowed her to expand her business to include a wide variety of quality toys. With names like Thomas Trains, Melissa & Doug wooden toys, Breyer Horses, German made Playmobil and many items made right here in the USA, you are sure to find something for the creative little mind. Our ever expanding baby section includes ultra soft sleepers by Kissy Kissy, Mudpie and American made fashions by Haute baby. To accessorize, shoes by Robeez, hairbows, bibs, swaddles, Petunia pickle bottom diaper bags and of course toys. Whether on the way to see the new baby at the hospital or buying a shower gift, we free gift wrap as always. Copyright © 2014 Grace's Toys & Dolls. All Rights Reserved.